West Island School opened in September 1991 and was initially housed temporarily in the former British Military Hospital premises on Borrett Road while the current site was developed. 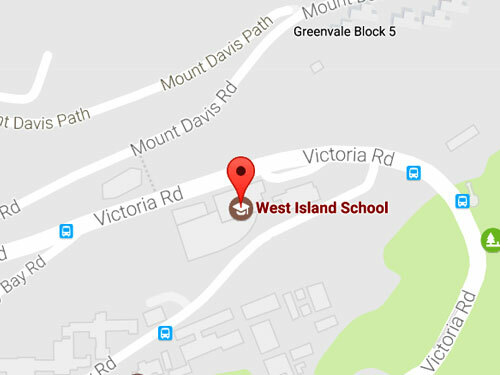 In September 1994 West Island School moved in to its purpose built award winning premises in Pokfulam, western Hong Kong, overlooking the busy Lamma Channel. The Right Honourable Christopher Patten officially opened the school on 7 December 1994; at that time there were just 410 students. Our community has steadily grown – by the year 2000 we had 1000 students and currently we have over 1200 from over 40 different countries around the world. The design of the building utilizes the space and natural environment and makes the most of difficult development conditions to provide comfortable and effective areas for both studying and relaxation. The two sports halls, indoor swimming pool, auditorium and multi-purpose halls are useful large spaces for performances, exhibitions, sports and other events. The school’s design follows the natural contours of the slope in to which it is built and has conserved and integrated large existing trees in its landscaped garden to be empathetic with its environment. The school has four main teaching blocks linked by open walkways and there is an abundance of views to the sea from many areas of the school. Our facilities are available for hire by the public after school hours, at weekends and during school holidays. All classrooms are fitted with the latest interactive and digital facilities, served by a wireless network throughout. For more information please contact the school at wis@wis.edu.hk or telephone 2819 1962.